University of California President Janet Napolitano will make a special appearance at the ceremony, which takes place on Saturday, February 2, at Hotel Nia. Yellen, who headed the Federal Reserve from 2014 to 2018, will receive an award that recognizes individuals of exceptionally distinguished achievement whose work and contribution to society exemplify the vision and ideals of UC Santa Cruz. UC Santa Cruz economics professor and alumnus Michael Hutchison (Merrill ’76, economics) described Yellen as a brilliant economist, teacher and mentor. 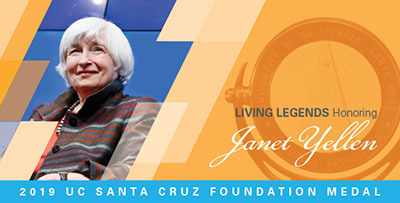 "Janet Yellen embodies all of the best personal characteristics associated with the UC Santa Cruz Foundation Medal-- a lifelong commitment to excellence in higher education and public service,'' Hutchison continued. "Her career as an economist, professor and policymaker in government service spans almost fifty years, and in each stage she has enlightened, inspired and challenged those around her." She is also noted for her patient, measured, and accessible explanations of monetary policy while being a thoughtful leader of the Federal Reserve. "Perhaps the most challenging task of her career to date has been leading the Board of Governors of the Federal Reserve System, both as Vice Chair and Chair, during 2010-2018," Hutchison said. "She took the reins at the Board when the nation was in deepest recession since the 1930s, as the Federal Reserve was struggling to get the economy moving and financial system back on its feet. She ended her stint eight years later with a booming economy, very low unemployment and a robust financial and banking system, all the while threading a delicate path between establishing a robust economy without igniting inflation." During her tenure on the Fed, some considered her the most powerful and influential woman in America. Before becoming the first woman to head the Federal Reserve, she served as vice chair of the Federal Reserve, CEO and president of the Federal Reserve Bank of San Francisco, chair of the White House Council of Economic Advisors under President Bill Clinton, and professor at the Haas School of Business at UC Berkeley. Yellen also has a long association with the University of California, and has worked closely with UC Santa Cruz economics faculty. As president of the Federal Reserve Bank of San Francisco from 2004 to 2010, she was very supportive of UC Santa Cruz's Santa Cruz Institute for International Economics, and the SF Fed co-sponsored several of its economic conferences. In 2006, she delivered the conference’s keynote address, "Monetary Policy in a Global Environment." Carl Walsh, UC Santa Cruz distinguished professor of economics and an expert on central banking and monetary policy, counts Yellen as an important influence on his research. Walsh said that her work, in conjunction with Yellen’s husband and frequent co-author George Akerlof, contributed to the understanding of economic fluctuations and unemployment. Yellen’s academic contributions, especially her studies on unemployment, were directly relevant to policy issues she faced while heading the Federal Reserve during the recovery from the Great Recession of 2008–09, Walsh noted. “Her understanding of the costs of excessive unemployment was crucial in ensuring the Fed, under her leadership, adopted a slow and steady pace for raising interest rates that allowed unemployment to continue to fall to levels not seen since the late 1960s,” Walsh said. Registration is available for this special event, which begins at 6:30 p.m. with a reception. The program starts at 7:30 p.m, and will be followed by a dessert reception. Tickets, which cost $100 per person, are limited. Sponsor packages are also available.